Adipocytes are the cells that primarily compose adipose tissue, specialized in storing lipids. Formerly considered as a mere receptacle for storage and combustion of triacylglycerol. It is now recognized that adipocytes sense external and internal stimuli and act both locally and distally to adjust whole-body energy balance. Besides the biological repertoire necessary for storing and releasing energy, adipose tissue communicates with distant organs including the central nervous system. Adipocytes secrete a variety of bioactive peptides (adipokines), which act at both the local (autocrine/paracrine) and systemic (endocrine) level. In addition, adipocytes express numerous receptors to respond to traditional hormone systems as well as the central nervous system. Through this interactive network, adipose tissue is integrally involved in coordinating a variety of biological processes including energy metabolism, neuroendocrine function, and immune function (Reviewed here) . White adipocyte‘s cytoplasm contains a one large lipid droplet. The nucleus is flattened and located on the periphery. A typical fat cell is 0.1mm in diameter with some being twice that size and others half that size. The fat stored is composed primarily of triglycerides. Brown adipocytes transfer energy from lipids into heat. 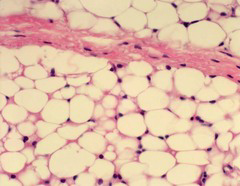 Unlike white fat cells, these cells have considerable cytoplasm, with lipid droplets scattered throughout. The nucleus is round, and, although eccentrically located, it is not in the periphery of the cell. The brownish color comes from the increased density of blood vessels. It is been shown here that the number of adipocytes stays constant in adulthood in lean and obese individuals, even after marked weight loss, indicating that the number of adipocytes is set during childhood and adolescence. Approximately 10% of fat cells are renewed annually. The mean age of adipocytes is hence 9.5 years. Neither adipocyte death nor generation rate is altered in early onset obesity, suggesting a tight regulation of fat cell number in this condition during adulthood. A further study shown that stored lipid age was 1.6 years. This implies that triglycerides, on average, are replaced six times during the lifespan of the adipocyte, enabling a dynamic regulation of lipid storage and mobilization over time. 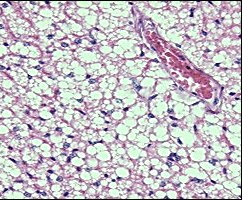 Adipocyte lipid turnover, however, is strongly related to conditions with disturbed lipid metabolism. In obesity, triglyceride removal rate (lipolysis followed by oxidation) is decreased and the amount of triglycerides stored each year is increased.